Bio: Lynn Goldstein has been creating art professionally for nearly thirty years. After seventeen years as a graphic designer and illustrator Lynn took the plunge in 1998 to becoming a full-time fine artist work in pastel and other mixed-media. Early in her career as a graphic designer, a weekend job in a Japanese print gallery introduced her to prints and Japanese formats, which has had some bearing on her subsequent work. Lynn graduated with a degree in Fine Art from West Virginia University, and later studied with some of the finest contemporary artists in the United States. 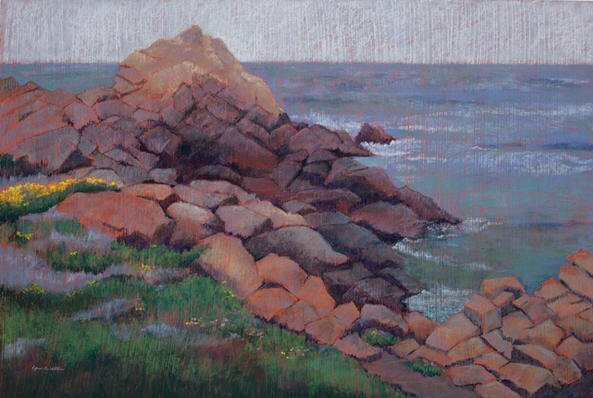 She has earned signature membership in the Maryland Pastel Society and membership in the Pastel Society of America. She is also a juried studio artist at the Workhouse Arts Center in Lorton, Virginia. Lynn has taught many workshops in the mid-Atlantic region, and also workshop classes at the Smithsonian National Portrait Gallery, where she also has volunteered her time as a docent, guiding tours of the gallery for many years. This experience has allowed Lynn to study, understand, and pass on the best of America’s art masterpieces. Lynn has exhibited widely in nationally juried exhibitions and galleries, and her work may be found in private and public collections throughout the United States and abroad. One of her paintings is in the permanent collection in the Jean-Haffen Museum, Dinan, France, where she did an artist residency in 2011. Her work is represented at the Washington Street Gallery in Lewisburg, West Virginia, and has been exhibited at Koehnline Museum of Art in Des Plaines, Illinois, Eleven Pleasant Street Gallery in Kennebunk, Maine, and at the Palette & Chisel Academy of Fine Arts in Chicago, among other locations. Additionally, her work, in particular her Reaching series on tree canopies, was profiled in the August 2009 issue of the Pastel Journal. Gallery: Landscapes; Inspired by Iceland; Abstracts; Sold Work.